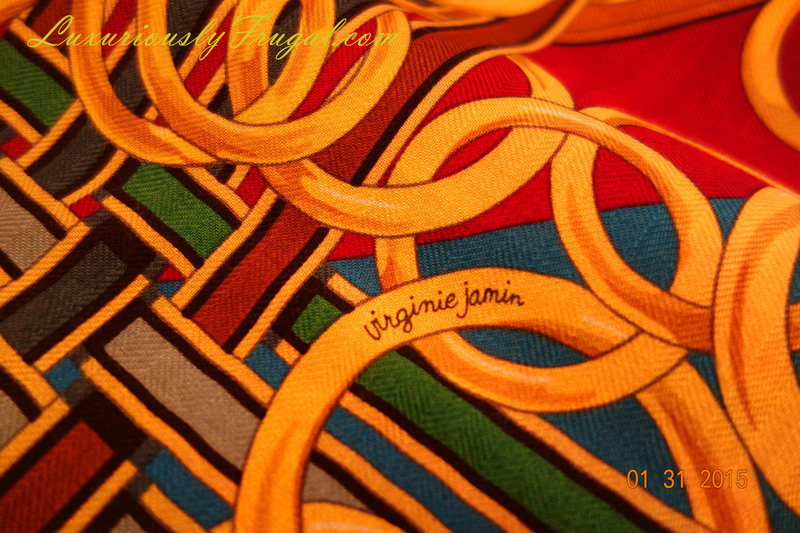 For our anniversary in January, my husband got me a Hermès shawl. Well, actually I picked the gift, drafted the anniversary card, and swiped the credit card. All he did was acknowledging the purchase. Not romantic, but works beautifully. I love the efficiency that comes from this kind of gift giving. He is not stressed about whether he is getting the right thing for me. I am not stressed about whether he is wasting money on some nonsense. Yet, we can still attach a lasting tangible item to this anniversary. 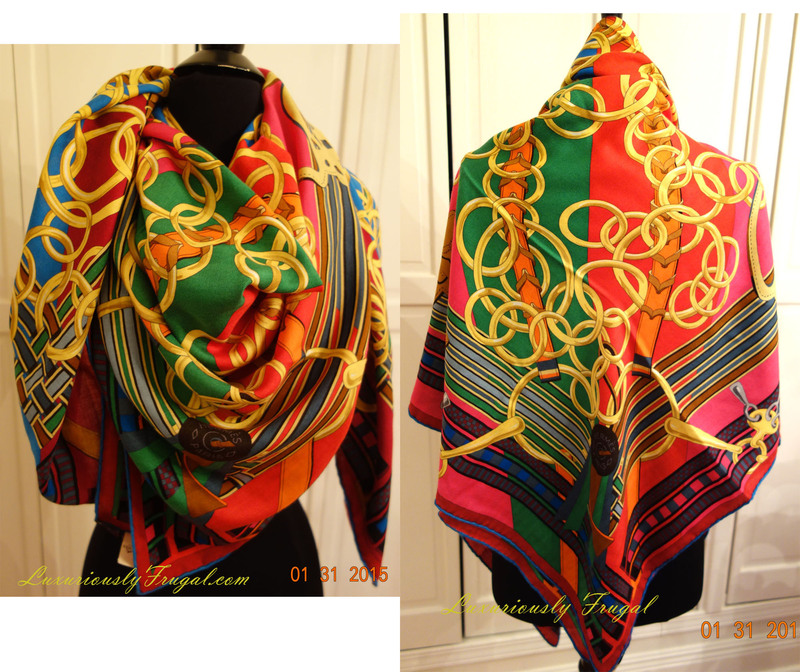 Choice: Shawls from current seasons that are available on Hermes.com or in store, or shawls from past seasons on ebay or other online stores. Decision: I decide to go with current seasons for two reasons. First, I don’t want to risk buying a fake one. Second, since I am buying it for our anniversary, I want it to be brand new and with a traceable birth. This decision narrowed down my selections to what is available on Hermes.com. b. Which design to choose? Choice: Over 70+ beautiful designs online. 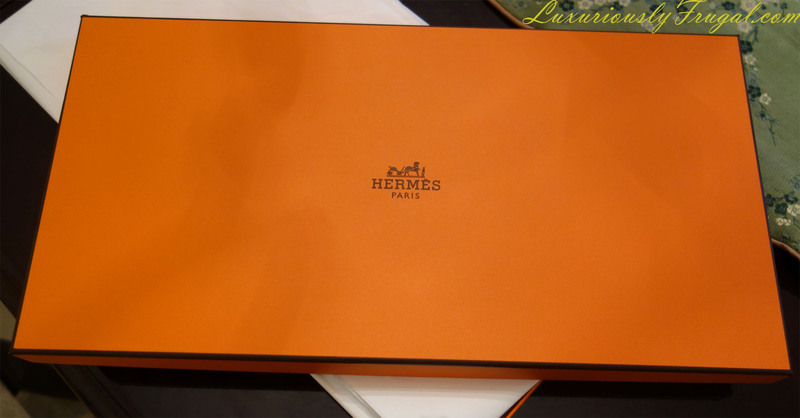 I went to a Hermes store to try out different shawls. The stores normally would not have all the designs available. So the key was to try out which colors fit my skin tone. I always loved blue and have many clothing items with blue hue. I thought a blue shawl would be perfect. But surprisingly, a heavily blue shawl does not cheer my face up and made me look sad/old. After trying about 20 shawls in store, I find that red/green/yellow fit me nicely. 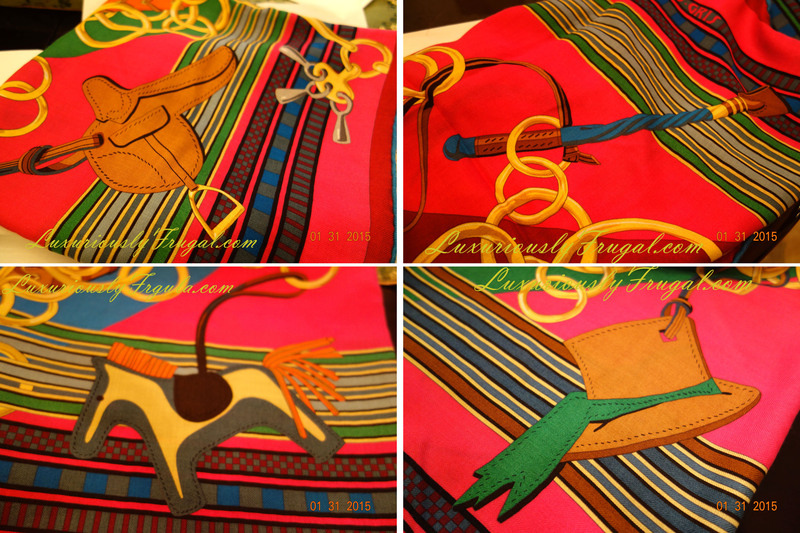 If you are thinking about buying a Hermes shawl, please go to a store to try the colors out. You may be surprised at your findings. 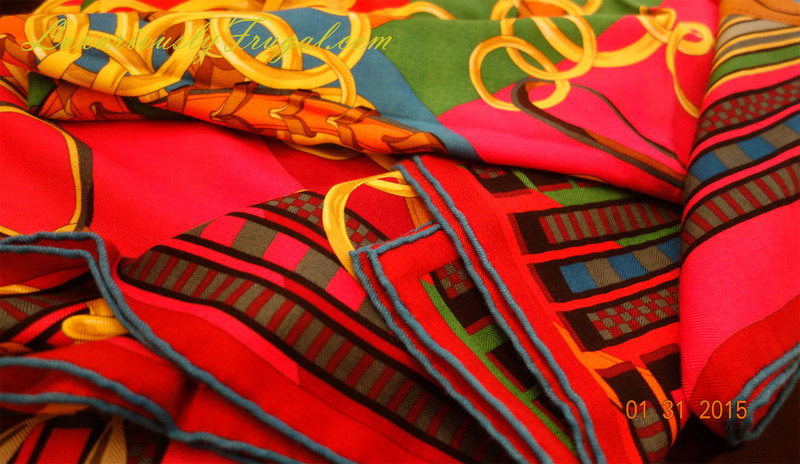 In mind mind, Hermes shawls should be bold and colorful, making a statement. So I was not interested in subtle designs. I want bold and colorful patterns in red, green or yellow. Maybe still a hue of blue just because I love blue. The diagonals of a shawl are very important. This is something I learnt from Maitai’s Picturebook. The more colorways the diagonals have, the more colors you can match to your wardrobe items. I crossed out a few choices because there is only one color along the two diagonal lines. As you will see from the picture below, the diagonal colors can totally make a difference. The last step is to research the designers on my final choices. Before I buy a luxury item, I always want to know who is the designer (didn’t I mention that I want a traceable birth for my babies?) I have turned down items I love because the designer is not my cup of tea. So after I narrowed down my selection of shawls to a few with red, green or yellow color patterns, I started researching the designers one by one. Google is fantastic. Don’t you agree search engines are one of the best inventions of internet? Color: Red/Green/Yellow, and YES! some blue too. Pattern: Very Hermes in my opinion. Bold and cheerful! Versatility: Four colors along the diagonal lines! Designer: Virginie Jamin, a children’s book illustrator and you can see her picture in this WSJ article. Her background explains why the shawl looks so cheerful! Decision: This was an easy decision for me. There is no Hermes store at where I live and I don’t pay taxes if I buy online. The only additional cost is a $35 shipping charge. I used my 2% cashback card to pay for it, which helps to cover the shipping charge. Now the baby has arrived, shall we have a baby shower? 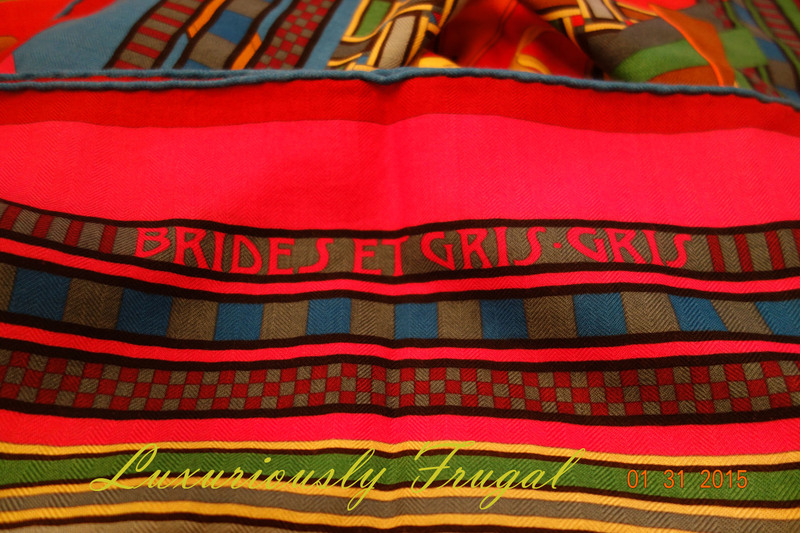 Colors, colors and the hand-rolled edges…. I am in love with this shawl! Cannot wait to take the baby out to get some healthy vitamin D fortified sunshine! Thanks, my love, for a memorable anniversary! 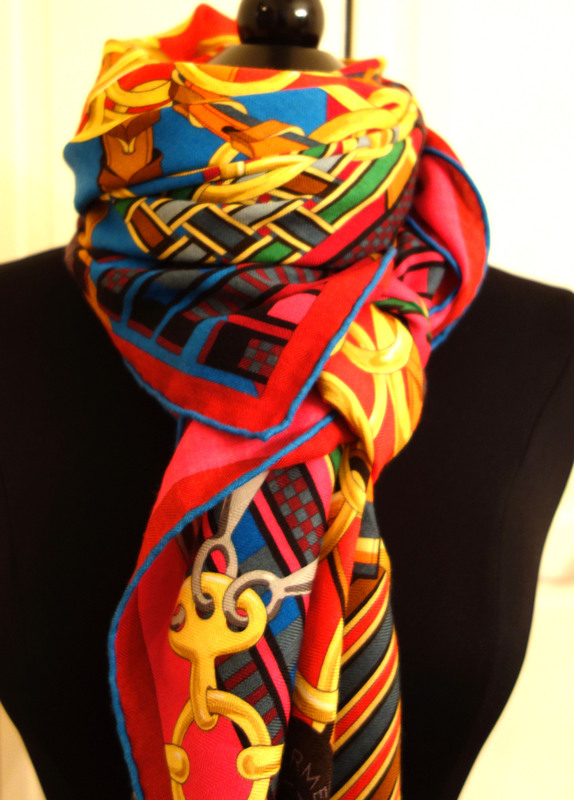 Amazing gift, I always loved Hermes shawls! Thank you, Carine! This is my first Hermes shawl. Really love it! I am looking forward to collecting more. Gorgeous choice & so versatile! I love MaiTai, too, have ordered a couple of her scarf rings & wear them a lot. My clothes are mostly solid colors, very few prints, mostly navy, grey, white, pink, and red, and I adore pairing my Hermes scarves with them. 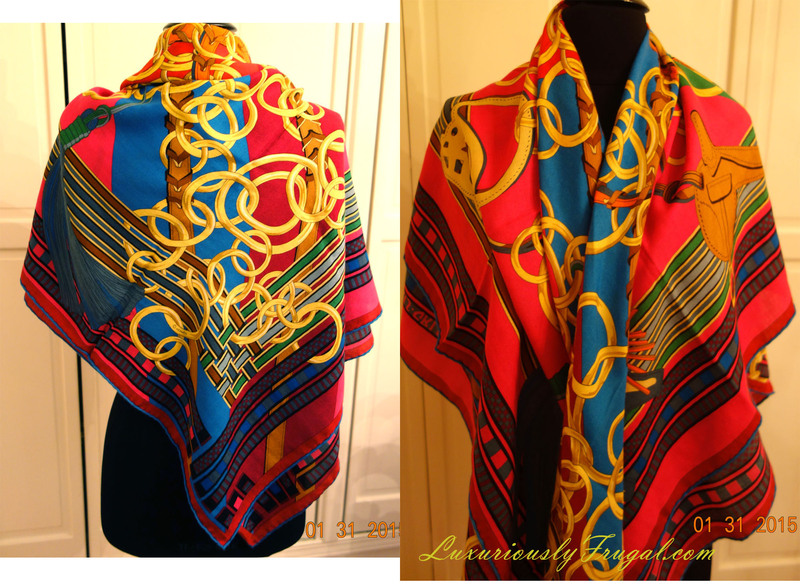 Over the years I have gradually accumulated the following scarves that were on my wish-list: 5 Hermes silk scarves in shades of blues and reds and grey, 1 Nordstrom medium-blue pashmina, and 1 Etro wool shawl with all “my” colors in it. I wear one of them nearly every day except in the hottest of summer days when I carry a very lightweight cotton/linen oblong scarf from India. I hope you enjoy your new scarf and wear it as much as I wear mine! These are all I want and need, and I have exactly the ones I wanted, I won’t be adding any more. I wear one nearly every day, no matter if I’m dressed up or down, usually in some kind of “knot” or with a scarf ring, but sometimes just folded in half in a triangle and thrown around my neck with the short-point in back and the two long ends hanging down in front then throw on a jacket. Since I dress in basic separates in basic colors–primarily pencil skirts, sometimes skinny-jeans, knit tops, little jackets, & either heels or ballet flats–my scarves add color & patterns, and you are SO right, they make me feel so good to feel them and see them. Sometimes I choose them according to my mood! I finally got chance to search the scarves one by one. They are so classic and elegant. I love the Grand Manege and Abrabesques the most. I only have one Hermes silk scarf: Sichuan by Robert Dallet in light purple. I love pandas and that is why I got the scarf. I am still in the collection phase and plan to add one more scarf or shawl this year. Thank you so much for sharing your collection!